HealthOffice® school electronic medical record software&apos;s functionality is the most comprehensive in the industry, providing the school nurse and the nursing administrator the tools and reports necessary for “meaningful use” and to do their job in the most accurate, complete, and efficient manner possible. All of our school Electronic Health Records features have been designed to provide school nurses and administrators the benefits of fast, secure, and accurate documentation and reporting; generally available with one click of a button. Comprehensive Reporting allows review of individual and group data in seconds; along with instant access to information that supports the professional role of the school nurse, assists with individual student trending for early health and academic intervention, population-based statistics for emergency planning, risk management and community-based health trending. Billing Integration allows the quick and accurate recording of the specific ICD-9/10 codes, procedure codes, modifiers and other billing-required information, generally done automatically by use of templates, as a part of documenting the student encounter. Health Portal allows parents to fill out district forms such as Medical History, Immunization information, Prescription Authorization, Parental Consent, and Athletic Waiver through a confidential, secure, interactive web portal easily accessed over the Internet. 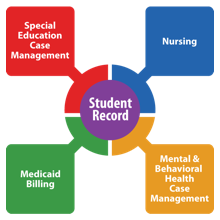 Once the information has been reviewed and verified by district personnel it will become part of the student&apos;s health record. Learn more about HealthOffice® Anywhere's school Electronic Health Record software by clicking here.